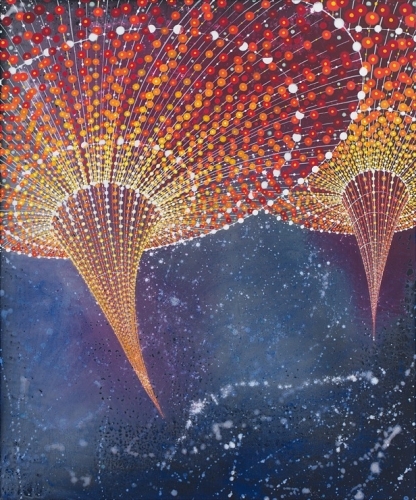 An abstract painter working in acrylics, Barbara Takenaga is known for her swirling, dot-based paintings of saturated color and undulating patterns. Her simple forms, arranged into dense and detailed composition, radiate and recede in what seems to be infinite space. Takenaga has been the Mary A. and William Wirt Warren Professor of Art at Williams College since 1985. Her first major exhibition was at the Walker Art Center, Minneapolis, in 1987, and her work has since has been exhibited at institutions including the Massachusetts Museum of Contemporary Art; the Museum of Contemporary Art, Denver; and the National Academy Museum, New York. "I still love the idea of the Big Bang," Takenaga has said of her work. "I feel like I am on this really giant ocean liner and I've got this little tiny steering wheel, and I'm turning and turning and turning it, and I'm trying to make a different course for the ship, turning and turning the wheel, and nothing happens. Finally, the thing--me, my attitude, the history of the work, the paintings themselves--because its mass is so big, it starts moving, ever so slowly shifting."